I’m a member of that secret club of guys who are just fascinated with flashlights. I own probably over a dozen. The Streamlight ProTac 2L is my favorite. The 2L retails between $35-$65 US; the price places it at the low end of premium/tactical/professional grade (or whatever you want to call it) LED-based lights. Some lights can run into the hundreds of dollars. But let’s be real. Even a freak like me can’t come up with a reality-based excuse to spend three figures on…a flashlight. Luckily, I don’t have to because the 2L satisfies my flashlight yearning for not a whole lot of dough. The 2L is made of heavy grade aluminum and has a tempered glass lens and a sturdy metal clip; the only plastic on the outside it is the rubberized power switch at the end of the tube. Streamlight claims the 2L is waterproof to one meter for thirty minutes. I haven’t tested that aspect of this light, but my impression is that the claim is true. The light can be switched between modes by quickly tapping the switch: Twice for strobe, and three times for low beam. This takes quite a bit of practice and I often land on the strobe when I really want low beam. There is also a way to “program” it to disable the strobe. The programming process is very tricky and I have not been able to make the feature work. Perhaps it’s just me, but a flashlight should not come with a learning curve. 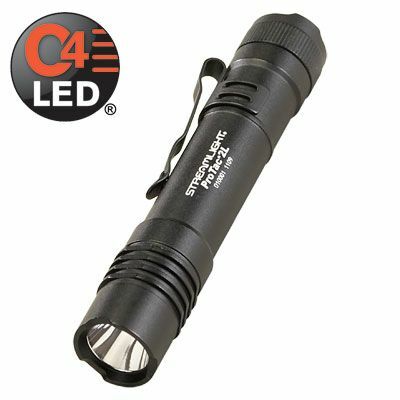 The Streamlight ProTac 2L uses two CR123A batteries. I can’t hold it against Streamlight for going with an expensive power source. A big beam in a small package requires something beyond the usual AAAA-AA-C-D battery options. The cost of the batteries is offset by a long runtime. What I don’t like is that you cannot use rechargeables. Streamlight states rechargeable batteries will damage the unit. I was unaware of this until my light started failing. When I sent it in for repair, Streamlight returned a brand new 2L, no charge, not even for shipping. Included was an explanation that, they really really mean it, rechargeable batteries are off limits. I switched to disposable batteries and have not had a problem since. My Streamlight ProTac 2L goes everywhere with me and doesn’t give me the “I must be nuts for spending so much on a flashlight” feeling I know I would have if I were walking around with a light costing two or even three times as much. Pros: Lots of light without lightening your wallet. Very sturdy, all-metal construction. Streamlight stands by its product. Long battery run times. Excellent performance & reliability. Cons: Difficult to switch between high-strobe-low. Does not work with rechargeable batteries. “Programming” a flashlight? Really? Bottom line: Not a toy. True tactical quality flashlight performs far beyond its price. $35-$65 on line & retail.